Tail grab to tail grab FTW. It was comeback time for Swiss freeskier Elias Ambühl tonight. Ambühl—who’s been out of competition for two straight seasons with injuries—showed he’s not ready to give up the game to the young’uns just yet, winning the Milan FIS World Cup Big Air in style with a switch double cork 1440 trailing tail (score 86.4) and a massive double cork 1260 trailing tail to lead tail (90.8). It was almost like he hadn’t been gone at all. On the women’s side, French skier Coline Ballet-Baz clinched the top spot with an immaculate cork 900 trailing tail (87.2) and a clean switch bio 900 safety (90.2). Coline Ballet-Baz on her way to the win. 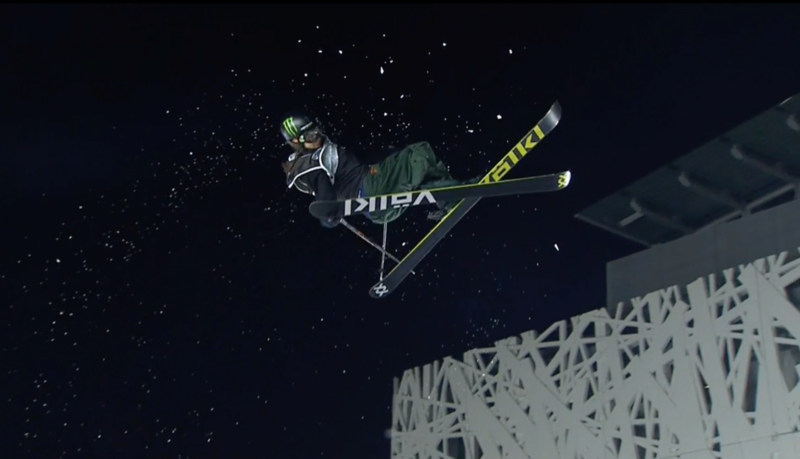 Hugo Burvall of Sweden took the men’s second-place spot with a nose-butter double cork 1260 safety (85.8) and a huge switch double cork 1440 double japan (90.4), followed in third place by Andri Ragettli, who laced up a triple cork 1440 safety to truck driver/bow-and-arrow (89.4) and a switch double misty 1260 trailing blunt (84.4). 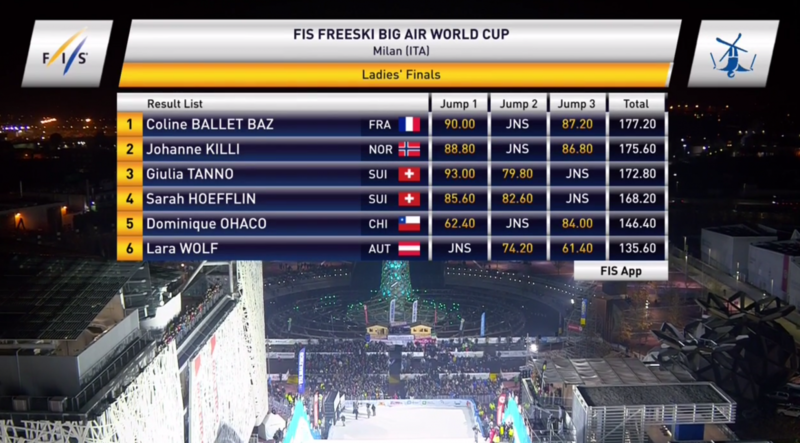 Women’s second-place finisher Johanne Killi of Norway landed a big cork 900 tail (88.8) and a switch 720 double japan (86.8). The women’s podium was rounded out by Switzerland’s Giulia Tanno, who landed the first-ever forward double cork 1080 in women’s competition for a score of 93.00, as well as a switch left 900 safety (79.8). On her third and final hit, Tanno was looking for the switch 1080 and the win, but couldn’t get the spin around in time. Meanwhile on the men’s side, Elias Syrjä posted the highest score of the evening, a 93.4, with a pre-grabbed double cork 1260 safety—the same trick that won him the Sosh Big Air event in Annecy, France last month. On his last hit Syrjä went for broke with an attempt a switch triple cork 1260, but couldn’t put it down clean. Interestingly, the American and Canadian teams don’t seem very interested in attending W.C. Big Airs this year. Only a single American, Mac Forehand, dropped in in Milan tonight, making it to the finals in his first World Cup appearance. Now that we’ve seen Forehand, we want to know what his backhand looks like. After event cancellations in El Colorado, Chile and Copenhagen, Denmark, the Milan Big Air was the first World Cup Big Air event this year. The next event will be held in Mönchengladbach, Germany on December 1. 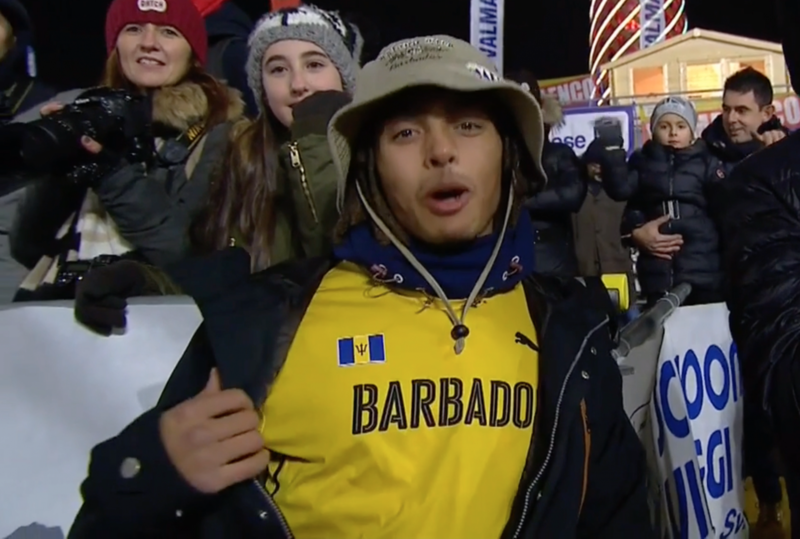 Only one burning question remains to be answered: who exactly is Victor White, the big-air competitor who’s apparently skiing for Barbados?